At the recent SID show in Los Angeles the first 6.8” flexible and mechanically robust EPD display, based on an organic TFT backplane, was exhibited. Flexterra (http://www.flexterracorp.com) has collaborated with E Ink (https://www.eink.com) to achieve this goal in a G2.5 line and thus demonstrated that Flexterra’s OTFT backplane technology is compatible with mass production of truly flexible ePaper displays. The 6.8” display was subjected to multiple impact resistance tests demonstrating compatibility with truly flexible display applications. This achievement was made possible by the use of proprietary materials developed by Flexterra and manufactured by SAES (https://www.saesgroup.com). SAES is ready to produce the materials leveraging on its state of the art organic chemistry plant. The SAES Group is pleased to introduce SAES Coated Films S.p.A.! A new entry in the packaging market but with 70 years of history because in SAES Coated Films converge in perfect synergy, the unique know-how in the materials science of the SAES Group and the consolidated know-how in the advanced packaging sector of the Italian Company Metalvuoto. In SAES Coated Films flow the competences for the development of flexible films and of advanced coatings thus making SAES Coated Films a global player able to offer worldwide innovative and technologically advanced solutions to guarantee more performance, more sustainability and more value to the packaging market. Read our article about "Getters for Cryogenic Devices" published by Cold Facts (The Magazine of the Cryogenic Society of America). The SAES Group was present at Seeds & Chips with Metalvuoto. 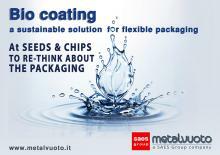 You can get more information about our innovative Bio Coating solutions from the attached presentation, held at the event by Dr. Stefano Tominetti (CEO Metalvuoto). SAES Pure Gas announces licensing agreement with Chemical Design Inc. Establishment of SAES RIAL Vacuum S.r.l. SAES Group announces the establishment of the new company, SAES RIAL Vacuum S.r.L. SAES RIAL Vacuum S.r.l. has the mission to design and manufacture state of the art, high quality vacuum components and integrated systems for accelerators, research systems and industrial equipment. Memry Corp. new building , September 16th 2015 Ribbon Cutting Ceremony. Precise Nitinol components, state of the art infrastructure, dedicated engineering teams all under a new and improved roof. Click here to read about. Sanan Orders Bulk Gas Purifiers from SAES Pure Gas for High Volume LED Production.